While we were working on the fresco, we imagined how beautiful it would be to recreate it with the "buon fresco" technique while maintaining the fidelity of the original image. Two apparently conflicting situations but, thanks to our proprietary technology, the PICTOGRAPHY, it has become possible. The fresco, by its nature, must have a quick processing. It is therefore technically impossible to make two identical frescoes with the "buon fresco" technique. Fresco is made up only of lime and sand. then, It is reinforced by a special net that allows it to be transported, It contains nor glue or industrial chemical elements. To add to the quality the fresco material is very thick. This protect against sudden temperatures changes or excess humidity. We add little water into the lime to create slaked lime. The colors are then freshly poured into the plaster, which has a curing process from 3 to 7 years. The slaked lime, in Italian “grassello,” is the part of the lime that has been transformed by adding water to the quick lime This process allows salts and alkalis to dissolve to make this material ready as a base for the “grassello” itself. By doing this, even in challenging environments we stabilize and fix the colours. The Colors. Inspired by Mother Nature, are 100 % natural. 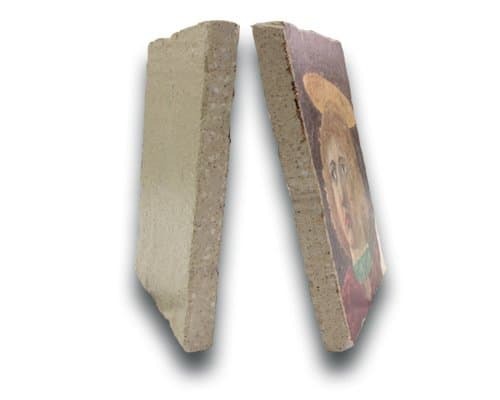 The use of color-based oxide, freshly poured in a slaked lime base and aged for three years , offers incredible levels of realism and it makes it look as if the fresco was painted from 500 to 2000 years ago. Retouched one by one, every piece is unique. Keeping an eye on every piece , our skilled artisans support each other in creating the highest quality of craftsmanship and art , thanks to the continuing studies in our workshop of art. Relief on fresco is executed with both natural plaster and natural glue, poured when they are warm and subsequently gilded with the leaf application Special chisels are used to engrave the lime with support to prevent sagging .